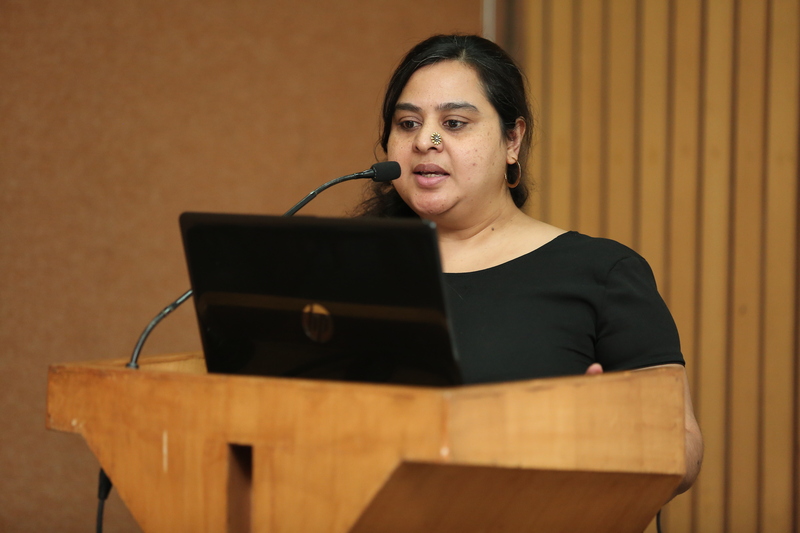 The Delhi phase of the ‘Gendering the Smart City’ project culminated in a day-long workshop, where the project team shared and presented the outlines and the key findings with the many stakeholders such as academics, art practitioners, urban planner and designers, community organisers. The workshop engaged with many diverse concerns and issues around questions of ICT, safety and urban imaginations. Dr. Ayona Datta, the Principal Investigator (PI) of the project presented the different contours of the project, including the research questions, objectives, the diverse set of outputs of co-production and its relation to the topic in enquiry. Along with a discussion of how technology is used in the margins, she spoke about how the project sought to address the Sustainable Development Goals (SDG’s), and over time, through sustained engagement with communities, the project also sought to critique of the top-down vision of the Smart city. As a participatory project it developed a critique of the intensification of the security complex as the quick fix to concerns of safety in any city. The paradox of the digital urban age was inherent in the complex interactions in the city, where one navigates poor infrastructure, both physical and digital alongside a fast paced urban identity, the social control of the community as well as a sense of freedom in digital space. Some of the key findings of the project included that digital capacities should not be conflated with merely owning a mobile phone, and in spite of accessing digital spaces, most people are ghettoised and continues to be dependent on isolated WhatsApp or other social media networks, which do not necessarily translate as access to knowledge and information. Dr. Padmini Ray Murray, the Co-Investigator (CoI) discussed her engagements with digital humanities and the question of digital knowledge via the Wikipedia. One of the key moments of the project was conducting a participatory workshop to write a Wiki entry on the site (in this case, a resettlement colony in Delhi). She spoke about the significance of challenging this top- down approach to knowledge where much of the wiki entries are written in the global north. Here, she also shared the significance of using oral citations as knowledge, particularly in the global south where this has been a mode of disseminating knowledge. She argued that the project precisely aimed at challenging the ownership of knowledge production that is restricted within exclusive spaces and with the state, and these were the reasons behind using colloquial (not formal) names to junctions and crossings in the description of the colony in the wiki page. She argued very strongly that such bottom up approaches to knowledge production can rescue us from knowing and seeing through the Google model of the world. Arya Thomas, the Research Assistant discussion the methodology and processes of co-production – what she called ‘WhatsApp ethnography‘. The method of research was very different from traditional tools like mapping and interviews, though these tools were also incorporated into the project. The interaction with the participants was primarily through a WhatsApp group, as the majority of them had access to cheap mobile phones and data. This facilitated an interaction where filters, otherwise in place were absent to an extent. The medium facilitated instant sharing of experiences of various facets related to safety, livelihood, community and social networks. When the whatsApp group is formed, it takes a life of its own, where dynamics with each other, a sense of collectivity-connectivity is constantly formed, all the time, when there is internet access. Rwitee Mandal from Safetipin shared about the findings from the use of the Safetipin App in the project site. She argued that this App allowed for the quantitative evaluation of a varied set of parameters that are determinants to gauge safety in the city. She also argued that the App primarily attempted to give a sense of power to the user to determine whether a place is safe or unsafe. The discussions in the first panel raised some very important questions about interrelation of access and capacities and time and space. The disjuncture between the clock time of the modern city and the lack of physical and digital infrastructure, the social time of the family\neighbourhood and the contradiction it holds towards understanding safety and freedom were the broad directions in which the discussions took place. The second panel brought together various practitioners engaging with technology such as a community organizer, an art practitioner, academic and those engaging with tech policy. Though situated in different disciplines, all of them through their work have engaged with questions of technology and its relation to gender. Sarita Baloni from Jagori shared the nature of work carried out by their organization in the field sites. Jagori has been working in 4 low income settlements in the urban peripheries, all of them resettlement colonies. She argued that to talk about violence on women, one had to engage with safety, which took them to questions of infrastructure and services from the government, as they understood that these seemingly disparate aspects were interlinked. She also shared about their work with youth, both male and females in the communities through mediums such as wallpapers and community radio programs. Swati Janu from Micro Homes Solutions CITY LAB spoke about the need to concentrate on self construction in informal colonies especially, rather than arbitrary mechanisms like evictions, resettlements or tech fixes. She argued that her project, Phone recharge ki dukaan, correlated to recent studies that argue how data has become a common commodity in the market, akin to buying vegetables, where one buys it in kilos\GB’s. Through her research practise, she also argued that the public nature of the project meant that there was more engagement from men and children, and that one has to look for private and semi-private spaces for women’s easy participation. Professor Krishna Menon from Ambedkar University spoke about the role of the university in knowledge production and the lacunas in the model, if it cannot accommodate practises such as this. She began her analysis by arguing that both gender and city are fluid categories, that are constantly changing and are susceptible to change. She spoke the need to include the voices from diverse social locations in our understanding of the city, and need for a feminist pedagogy or the feminist lens in order to move towards a feminist utopia. She argued that technology does not exist in void, and that there is a social context in which it operates, which is crucial in understanding how inclusive our models are. Nayantara Ranganathan from Internet Democracy Project shared through her research, the problems inherent in the tech-based solutions that hugely compromises individual autonomy and violates privacy. With the motto of the tech age, if you have nothing to hide, then you have nothing to lose becoming the common-sense that legitimates the vast surveillance machinery, she argued that the inbuilt mechanisms in the emergency Apps are inherently antithetical to women’s agency and autonomy. The mechanisms like geo fencing, compulsory panic buttons, track options, sensory alerts; all denote the contradictions that lie deep with such mechanisms which only strengthen the neo-liberal approach to data and does not constitute a feminist understanding of safety and security. The post lunch session opened with the launch of the artistic co-production, Khadar Ki Ladkiyan, a hip-hop music video made by the participants in the research. Sunayana Wadhawan, music director and Nandan Latwal, film director shared their experience of working with the participants, writing and making music and shooting the video given the challenges of time\resource, including infrastructure, light, sounds etc. How local infrastructure (power cuts, lights, market sounds) always played a contingent role, and was hence integrated into the process was a challenge highlighted by both. The main points in focus were the participatory approach of both the song and the video, and that such processes lead to artistic forms experimented by people anywhere. The participants also shared with the audience the challenges they faced from their families, neighbourhood and community through the course of the project and what impact this had in their lives. 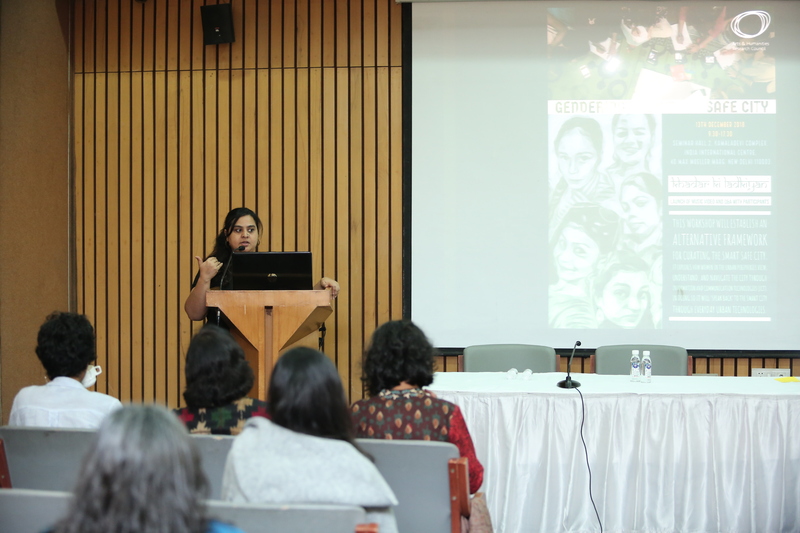 Kruttika Susarla took us through her work as a graphic designer who works on making feminist learning more accessible and comprehensible through the visual media. Through comic strips, visual designing and graphics, she continues to engage with youth about the history of the women’s movement, gendered socialisation and critiques the existing stereotypes through humour and graphics. 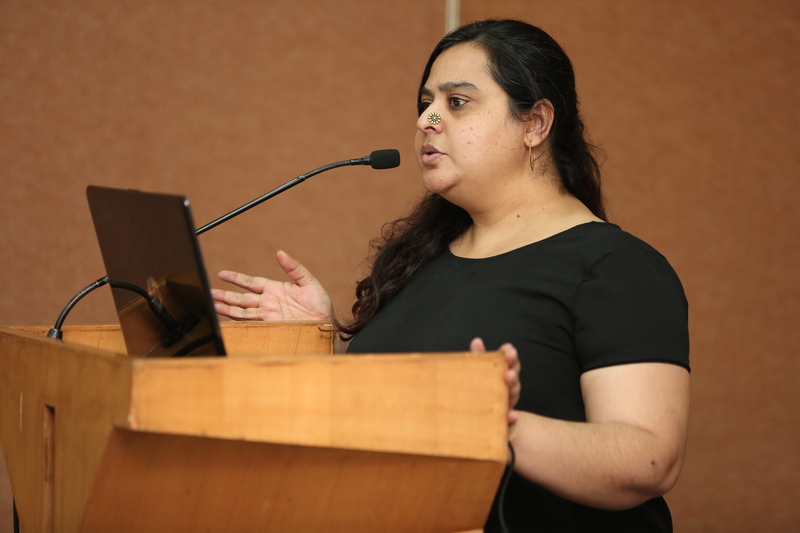 Shveta Mathur, Visiting Faculty at School of Planning and Architecture discussed the student design interventions from their lab which worked with the project. She discussed the possibilities of design interventions, where the community can be mobilized to carry forward some of the innovative designs. The students had developed various interesting designs such as pop-up play grounds, moving libraries, short enterprises for women in public places and an imagination of an alternate street along the rooftops in density high neighbourhoods. Sameera Jain argued that there is a problem of internalizing the gendered nature of the city, where leisure and loiter are absent gendered, making the modern city a very male space. Clips from her documentary on young women employed in the informal sector spoke of the challenges and void in our everyday lenses, through the everyday experience of women in the city. The discussions centred on whether the design interventions were utopian or practical- as in the willingness of the city authorities to engage with such community level design interventions. The workshop closed with a round table discussion moderated by Kalpana Vishwanath, co-founder and CEO of Safetipin. Between Arunava Dasgupta, the Head of the Department in SPA, Janaki Abraham, Assistant Professor in Sociology and Sohini, CEO of Breakthrough, the discussion centred on three aspects – the problems inherent in the entrepreneurial imaginations to the city, which is profit-driven, top down and exclusive, the questions of inclusivity, across class, religion, gender, caste and disability, and the need for strategies for interventions at multiple levels in order to initiate more conversations\interventions. The day concluded with introducing our work in the next phase of the project in another city with the participants. Geetha Nambisan from Jagori thanked the ‘Gendering the Smart City’ project for the impact that it had had on Jagori’s own work and most importantly ‘for bringing Jagori back to Jagori‘ through the co-production of the song and video. The finale was a live rendition of ‘Khadar Ki Ladkiyan’ song by the Khadar Girls. Read the workshop concept note here and programme here. Explore the event Wakelet with all of the Tweets from the day here.